Tile and Grout Cleaning in Winter Garden, Ocoee, Windermere, Clermont, and Orlando. Your grout will look as good as it did when it was new. We can seal the grout lines to keep them cleaner longer. STEP 1 ~ Visual inspection. We will join you in the inspection to be sure there are no damaged grout areas. 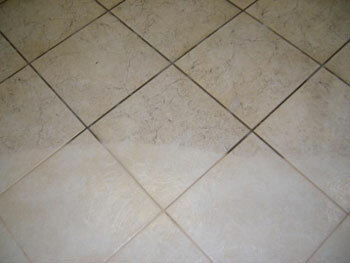 We also test to see which type of cleaner works best on your tile and grout. STEP 2 ~ Prespray the tile and grout with a special solution which is made to break down grease and oils. STEP 3 ~ Agitate the prespray in the grout with a grout brush – if necessary. STEP 4 ~ Rinse the prespray with high-pressured hot water through our truck mounted machine. STEP 5 ~ After cleaning, we can seal your grout lines or, if you have travertine or natural stone, we will seal the entire surface. If your grout wasn’t sealed when it was new, it is a very good idea to have us seal it after cleaning. Beware of the cheap sealers that are sold in hardware stores as these water-based sealers DO NOT protect your tile very well. YOU MUST NEVER SEAL GROUT WITHOUT THOROUGHLY CLEANING IT FIRST as doing this will seal in any dirt that is in the grout. Can you get my grout to look new again? Our system will remove ALL oils, grease, grime and soil from your tile and grout. Even after the soils are removed, your grout may have some imperfections that cannot be taken out with cleaning, especially if the grout is more than 10 years old. If your grout is looking more dark or dirtier in your high traffic areas versus the areas you never walk on, you need professional cleaning. Many times this is the result of not applying a sealant when the tile was installed. If you have pets in your home, your grout gets very dirty from the oils in their fur, which cleans up very well. This usually is the biggest difference we see in cleaning. Urine stains in grout may lighten up tremendously or be completely removed. Other food, grease and oils normally clean up quite well too. Rust can be occasionally removed from tile.